One of the common ideas that provincial internationalists like to promote to themselves is that the EU enables member-state citizens automatically to live as equal citizens in any other EU country. This must be true, they think, because it is a right enshrined in EU laws (for example the consolidated Treaties of Rome and Maastricht’s Article “any discrimination on grounds of nationality shall be prohibited” 18). 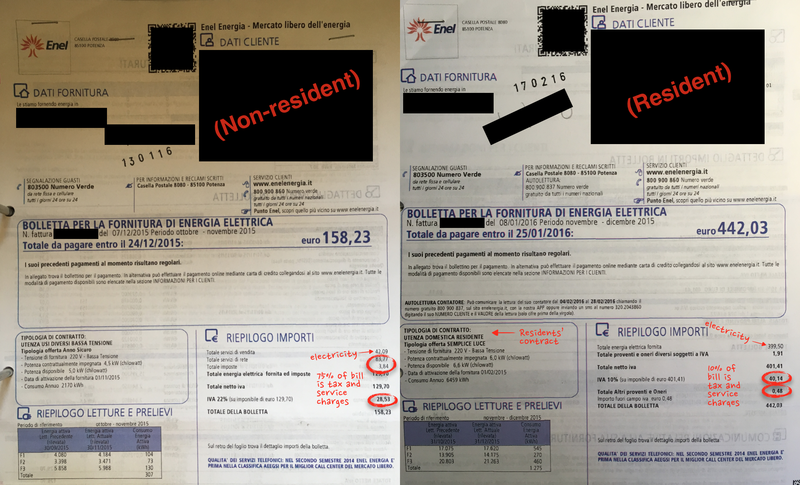 As a frequent migrant within the EU, I am one of the few people who would stand to benefit from such a situation if it were true – but I can tell you that my Italian electricity comes in at more than 400% the cost of my Italian neighbours’ – and will continue to do so unless I walk the long and litigious path to residency here. 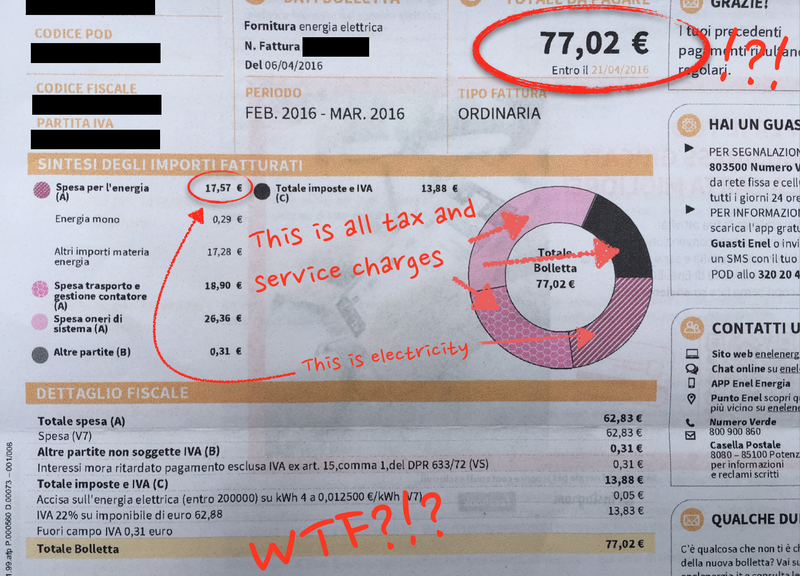 For the sake of objectivity – here are two other bills from the same electricity company (ENEL). As you can see, the resident pays mostly just for electricity, whereas the non-resident pays mostly service charges and tax. Some service and tax rates may be fixed, but you can still see that, even in absolute terms, the Italian payed less in services and tax. Of course, the Euro-centrist might respond that the EU guarantees the non-residents’ right to residency and therefore the reduction of the bill – but I have also lived in Latin America and China and the situation is more or less the same everywhere: day to day life costs more for a foreigner until he is employed, married or in some way invested in his adopted society. Euro-centrists might be surprised to learn that this dynamic is not rooted in nationalism or xenophobia but in basic economics. The foreigner essentially has a low credit rating as he may disappear back to where he came from, misunderstand the terms of domestic contracts, or simply seek only short term custom for a utility with high set-up costs. At the point the foreigner arrives in his adopted homeland, he has almost no investment which ties him to the social or monetary economy of the society. Therefore, the market demands that he pay a little more upfront for everything in order to cover the average added cost to the supplier of people in his demographic. If, as the Euro-centrists would have us assume, foreigners paid equal rates in each others’ member states, the cost of the foreign risk would have to be borne by domestic rate-payers or taxpayers. And that really would not be fair. There are a few genuine perks offered by the EU for some special interest groups. For example, had my doctor been from the EU rather than the USA, he might not have had to undergo a three day supervision period before signing a contract with a European hospital. A few more public sector admin jobs have probably been created in local governments for graduates of over-subscribed humanities courses and, of course, the EU really is very good at helping wandering tradesmen of Nuclear Energy, peddlars of banking services, tinkers of spacecraft and handicraftsmen of motorcars to ply their wares across borders. But can we stop pretending that the EU makes more than a marginal difference to its citizens emigrating to Vienna or Rome as opposed to, for example, Quito or Shanghai? I know that suburban cosmopolitans like to cultivate an air of continental belonging by chattering about how their leaders have united forces with glamorous countries they visit for holidays – as if the political effort of unity somehow compensates for their unrequited lust for some Erasmus chick visiting from Slovakia or hot waiter they saw in Benidorm. But how long will the chattering classes remain immersed in the romantic idea that we are defying the laws of economic gravity in the interests of private individuals whose incomes don’t happen to depend upon the EU’s protection of ‘too big to fail’ corporations like Royal Dutch Shell or BNP Paribas or Allianz? For how long will Brussels be able to pretend that their policies have any positive impact on the few individuals, like me, who actually engage with the day to day life of other member states? The bottom line is that the individual migrant’s greatest hurdle everywhere on earth is in finding which officials’ offices he must approach and making his requests understood in a foreign language. The idea that some back-seat internationalist in a halogen-lit office a thousand miles away on the Hanseatic coast is somehow going to help him is simply mad. Now, I hardly need tell you that when the central bureaucracy can’t force things to work on their own terms, civil society reclaims its natural mandate. What you’re seeing in the photo here is the end result of decades of civil response to failed central planning. It’s what happens when people trust their neighbour more than their government. 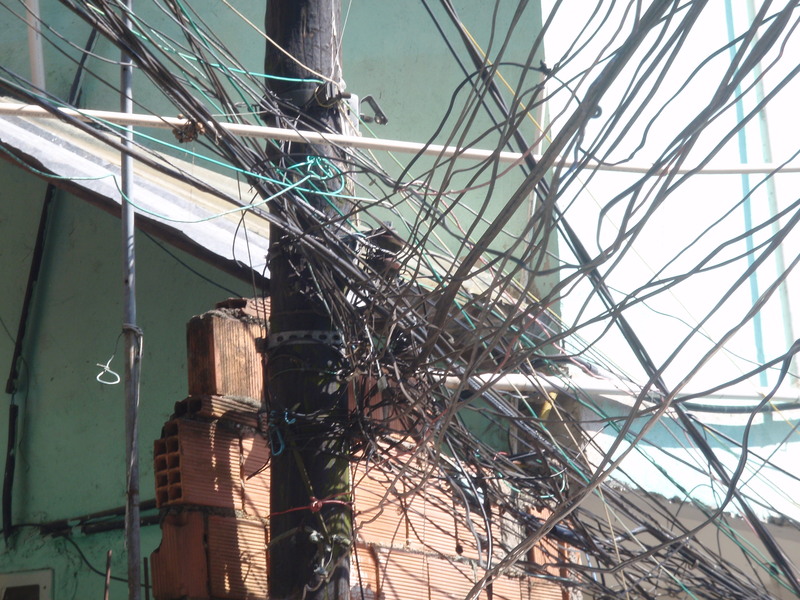 Most of the wires in that photo are probably not even in use. Many will be ‘hedge-bet wires,’ which could be activated in the event that some official, company, or individual decides to charge too much for line usage. The EU is going to collapse because it can’t begin to afford to do what it says it already does: command public bodies to ignore the economy. Perhaps a failure of the EU to prod ENEL to provide me with compensation for my bill would be a violation of my rights to equal treatment under their own laws – but it’s not worth contesting. ‘Arbitary discrimination’ may be illegal under bold headlines of EU law but, as the EU’s primary legislative purpose is to keep itself in existence (by passing reims of arbitrary footnote laws allowing ‘arbiatry discrimination’), any such incongruity would be ironed out by the quick generation of some little caveat if it hasn’t been already (OH! I think I just found it: Services Directive 2006/123/EC, Article 17, section 1, b). On the surface, people might think (want to believe) that Eurocrats have created a magic garden. You will continue to hear: ‘Oh, isn’t it convenient that we’re all connected and everything is so easy!’ No – it might look like it – but the facade is compensated for by a colossal river of silent legislation which, as far as I can see, is designed to enable things to work here just as they would work anywhere else on the planet from Kamchatka to Cape Town. Do we really need to pay people to do this for us? If you are British and would like to awaken these deluded souls a little faster, vote for Brexit. If you live in Quito or Shanghai, your EU traffic and parking fines won’t reach you, or if they do, you can shrug them off. The wonderful benefit of living within the Union is there is no escape from your driving peccadillos!